Honolulu will host one of over 100 events taking place throughout the U.S. on June 1 and June 2 as part of the National Day of Civic Hacking. Over 5,000 participants are expected to gather across the nation to leverage new data sets from local, state and federal agencies to create useful technology-based tools and services. 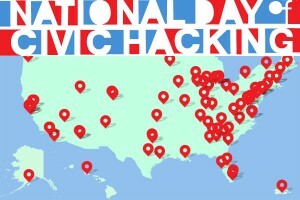 The National Day of Civic Hacking is an opportunity for government agencies, businesses, nonprofits and engaged individuals to work together to solve complex social problems. The initiative is based on event models created by Code for America, Random Hacks of Kindness, and Innovation Endeavors. And because this is a grassroots initiative, local organizers — such as Hawaii Open Data and the City & County of Honolulu — are adapting these models to create their own, unique experiences. Participants will gather tomorrow at R&D in Kaka’ako for “Hack to the Future.” There, they and will use their diverse expertise and entrepreneurial spirit to make an impact on our local community. We’ll look at new apps and tools created by the developer community as well as have participating government agencies talk about how open data collaboration can help their departments. A showcase of projects that emerge from the National Day of Civic Hacking will be featured at an event at the White House in the end of July, in tandem with the President’s focus on STEM education. The event is a call to action for anyone in Honolulu who wants to make a difference. Anyone can get involved, regardless of professional experience. Projects can address any challenge facing the community: from a mobile app to report broken street lights, to platforms that address food and housing distribution for those in need. The “Hack to the Future” civic hacking event will illustrate the power of open government practices, particularly where data is readily available to support meaningful collaboration between the public and private sectors. It is also an illustration of how the innovation community is active in all cities and towns in America, beyond just Silicon Valley. The partners creating this initiative are eager to foster new innovation ecosystems and elevate the visibility of existing tech and creative communities throughout the country.